Lord Alfred Tennyson(1809-1892) ‘Poets cut their quill on the teeth of adversity but the music must come from the harmony of celestial spheres.’ The life of Tennyson followed true to this adage. The poet’s grandfather breaking the rule of primogeniture made his younger son Charles his heir. Before Alfred was even born the silver spoon that was his birthright, was taken from his mouth, so to speak. The contrast of his own family’s relatively straitened circumstances to the great wealth of his aunt Elizabeth Russell and uncle Charles Tennyson made him feel particularly impoverished and led him to worry about money all his life. A blow felt keenly at the blind chance brought him other worries as well. He suffered from a lifelong fear of mental illness, for several men in his family had a mild form of epilepsy. His father and brother Arthur made their cases worse by excessive drinking. His brother Edward had to be confined in a mental institution after 1833, and he himself spent a few weeks under doctors’ care in 1843. In the late twenties his father’s physical and mental condition worsened, and he became paranoid, abusive, and violent. Since Tennyson was always sensitive to criticism, the mixed reception of his 1832 Poems hurt him greatly. Critics in those days delighted in the harshness of their reviews: the Quarterly Review was known as the “Hang, draw, and quarterly.” John Wilson Croker’s harsh criticisms of some of the poems in one anthology kept Tennyson from publishing again for another nine years. 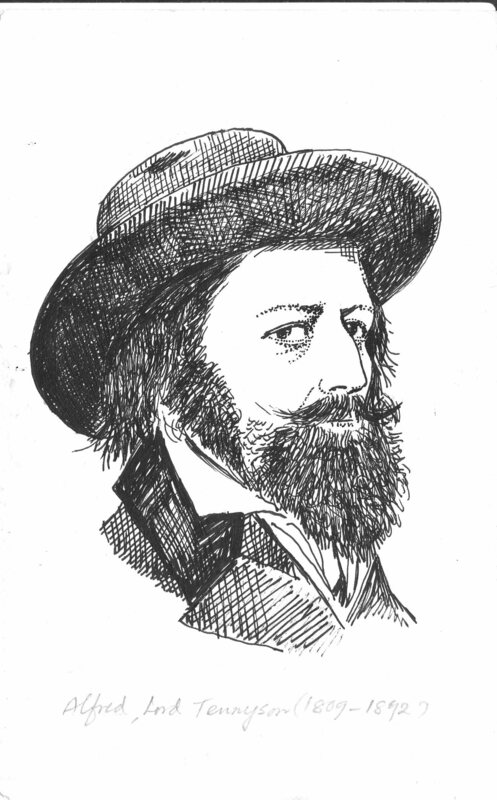 The success of his 1842 Poems made Tennyson a popular poet, and in 1845 he received a Civil List (government) pension of £200 a year, which helped relieve his financial difficulties; the success of “The Princess” and In Memoriam and his appointment in 1850 as Poet Laureate finally established him as the most popular poet of the Victorian era. By now Tennyson, only 41, had written some of his greatest poetry, but he continued to write and to gain in popularity. In 1853, as the Tennysons were moving into their new house on the Isle of Wight, Prince Albert dropped in unannounced. His admiration for Tennyson’s poetry helped solidify his position as the national poet, and Tennyson returned the favor by dedicating The Idylls of the King to his memory. Queen Victoria later summoned him to court several times, and at her insistence he accepted his title, having declined it when offered by both Disraeli and Gladstone. Benny…I enjoyed reading this piece, and as usual your portrait sketch is wonderful!